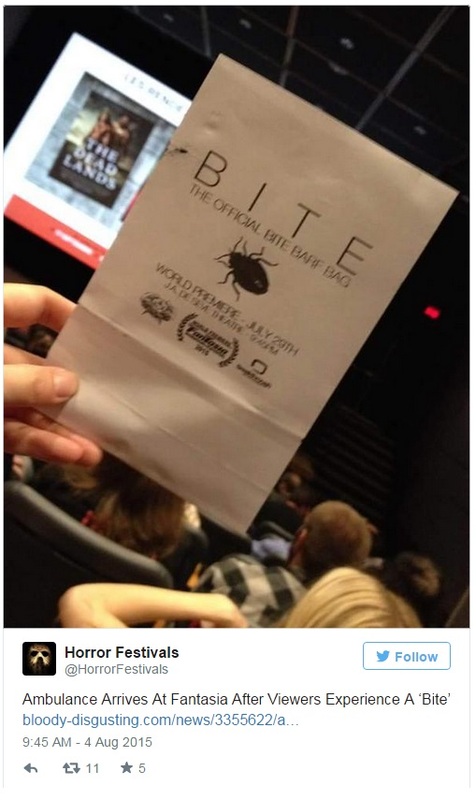 The film was shown at Montreal’s Fantasia International Film Festival and maybe some of those in attendance should have taken it seriously when novelty barf bags were given out as they filed into the theater. During the viewing, there was plenty of disgust, from Chad Archibald’s directing prowess, resulting in the need of the bags for those of the queasy stomached and with a few film-goers passing out, ambulances were called to the scene. Even without any other information, I have to see this movie right now! For the rest of you, here’s a little more info and a trailer. Watch it if you dare. While on her bachelorette party getaway, Casey, the bride to be, gets a seemingly harmless bite from an unknown insect. After returning home with cold feet, Casey tries to call off her wedding but before she’s able to, she starts exhibiting insect like traits. Between her physical transformation and her wedding anxiety, Casey succumbs to her new instincts and begins creating a hive that not only houses her translucent eggs, but feeds on the flesh of others. As her transformation becomes complete, Casey discovers that everything can change with a single bite. This entry was posted on Monday, August 10th, 2015 at 3:02 pm	and is filed under Events, Film, News. You can follow any responses to this entry through the RSS 2.0 feed. You can skip to the end and leave a response. Pinging is currently not allowed. « HBO’s ‘Westworld’ Releases Teaser!! !